You don’t need a fancy PrintShop program to make Christmas or birthday or Mother’s Day cards—you can do it with a paint program like Paint or KidPix, with a few tricks. 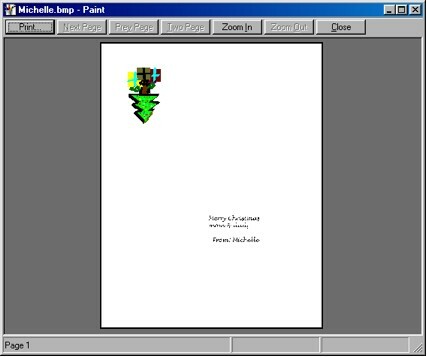 Here’s how to do it in Paint (which is included in all Windows versions from Windows 95, onward—look in the Accessories menu). 1. Open Paint. Set the page size to fit a standard 8.5 x 11” piece of paper: click on the Image menu, then on Attributes, and enter a Width of 600 pixels, and a Height of 800 pixels. Click OK.
2. Draw a picture in the top-left hand corner… do not go past the little dot at the top of the picture that indicates the half-way point. 3. You need to flip your picture upside-down (trust me on this!). To do so, select your picture using the dotted-line rectangle tool. 4. Click on the Image menu, then on Flip/Rotate. Select the Rotate by Angle option, then choose 180º. Click OK.
5. Move to the bottom left hand corner of the picture, using the scroll bars. Make a typing rectangle using the A tool. If you want to change the font or the size of the letters, click on the View menu, then select Text Toolbar, then click again in the typing rectangle. Print your card… To make it into a card, fold it once horizontally, then once vertically.